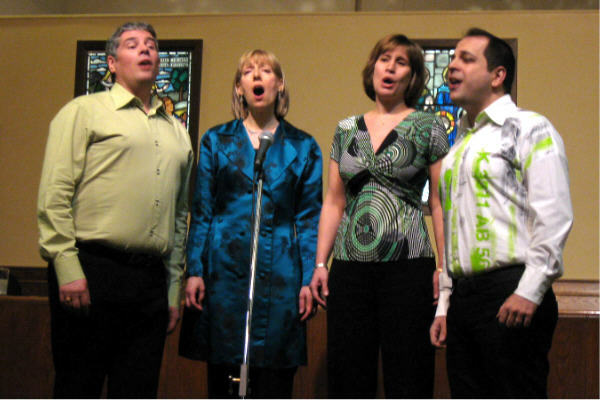 On Saturday evening, March 15, 2008, Summerlea's Outreach Committee presented the dynamic Montreal jazz quintet Guffman 5 (minus one) in an evening of jazz standards plus pop, folk, Broadway and a few surprises. During intermission folks repaired to Acadia hall to enjoy coffee or tea and dessert goodies prepared by the Summerlea congregation. Our thanks to the Guffman 5 for a very enjoyable evening which also served to raise funds for the needy of the Lachine community. Accolades to piano accompanist Gaétan. Stained glass windows from St. Andrew's Presbyterian Church as a backdrop. 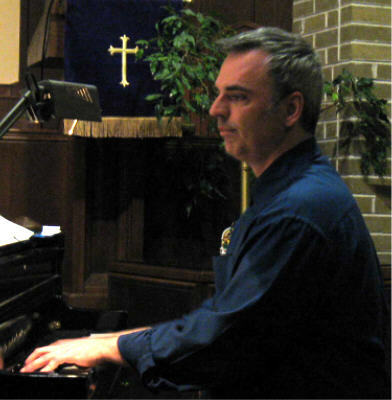 Piano accompanist Gaétan Daigneault tinkling the ivories.